Karauli is one of the historical places in Rajasthan and is believed to have been in existence since the time of the epic Mahabharata. Hence, you can find several ancient sites here. However, this ancient settlement is popular amongst tourists as one of the holiest cities in Rajasthan on account of the presence of more than 300 temples within its boundaries. Have you ever been to Karauli? If not, then you should plan a trip to this wonderful city. Home to natural sites, historical places and pilgrimage centres, it is an ideal place for every kind of traveller. Due to its location in the close proximity of Jaipur, it is a perfect weekend getaway from Jaipur. Wouldn't you love to savour the hidden beauty of Rajasthan? If yes, a trip from Jaipur to Karauli is your calling. Read on to know more about how to reach Karauli and its beautiful tourist centres. Karauli experiences an extreme type of climate and hence, winters are cold and summers are hot here. Therefore, it is a less preferred tourist spot during the summer season. The best time to visit Karauli is from October until the end of February. You can also visit it during the months of March and April when Kaila Devi Temple conducts an annual fair, which is attended by thousands of locals and seasonal tourists. By Air: The nearest airport from Karauli is located in Jaipur and hence, there is no way to reach Karauli by air if you are travelling from Jaipur. The best way is to hire a cab to Karauli. By Rail: The main city of Karauli doesn't have its own railway station, however, you can take a train to Hindaun Junction, which falls under the Karauli district. Once you have reached the railway station, you can hire a cab to Karauli city. The distance between Karauli town and Hindaun city is 30 km. By Road: Karauli has a good road connectivity and is easily accessible by road. You can either hire a direct cab or catch a direct bus to Karauli from Jaipur. If you are driving on your own, you can take the following routes. As route 1 takes about 3 h 30 min only, i.e., half an hour lesser in comparison to the other route, to reach your destination, it is the preferable and the fastest route. On your way, you can also explore the temples of Lalsot and the natural beauty of Gangapur. Located at a distance of about 80 km from Karauli and 95 km from Jaipur, Lalsot is famous amongst local tourists for its religious sites and other temples. Hence, it is one of the least-explored places in Rajasthan. Even though the exact history of this ancient town is still unknown, it is believed that it was established during the early Medieval Era by a Hindu king. It is also the place where the Rajputs and the Marathas fought a battle in the late 18th century. Hence, you can find several historical sites within its boundaries. The major places here include Shri Paplaj Mata Mandir, Khurra ki Mata and the historical village of Ramsala. Situated in the Sawai Madhopur district, Gangapur is a beautiful city which is known for its ancient temples and numerous picnic destinations. The presence of mountains, waterfalls and beautiful plains makes it a must-visit en route destination for you. The city has derived its name from the famous Ganga Temple, which is located within the city. Other places of interest here include Dhundheshwar Waterfall, Kalyan Ji Temple and Jama Masjid. Gangapur is located at a distance of about 140 km from Jaipur and 30 km from Karauli. Once you have reached Karauli after covering a distance of about 162 km from Jaipur, you can start your journey of exploring its hidden corners. Even though it is mainly popular for its religious centres, there are still several other places in the form of forts and palaces which will certainly interest you. Following are the major places which you cannot afford to miss on your trip to Karauli. How can you miss the invaluable splendours of Karauli which are nestled peacefully in the form of temples? The major temples and religious sites here which are visited by tourists from all over the state and remain flooded with thousands of devotees and tourists during the festive seasons include Kaila Devi Temple on the banks of Kalisil river and Shri Mahavirji, one of the significant places amongst Jain followers. 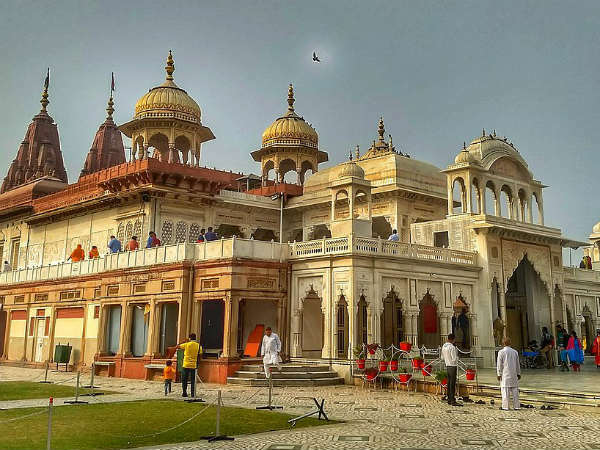 Other important temples include Madan Mohan Ji Temple dedicated to Lord Krishna, Mehandipur Balaji Temple dedicated to Lord Hanuman and Nakkash Ki Devi dedicated to Goddess Durga. How about getting yourself to this temple city and getting lost in its spiritual world filled with divinity and collectedness? The discussion about any place in Rajasthan is certainly incomplete without talking about its historical monuments in the form of forts and palaces. Hence, the majestic forts and the royal palaces in Karauli district deserve to be mentioned. The list of these historic buildings include Bhanwar Vilas Palace, City Palace, Mandrayal, Timangarh Fort and Amargarh Fort. If you are a history lover and always look forward to exploring beyond boundaries, then you can also visit Devgiri Fort and Garhmora, which are located at a distance of about 70 km and 90 km respectively. Yes, Karauli is also home to several natural sites where you can enjoy the beauty of a pleasant weather and green surroundings. These places are mainly popular amongst picnickers and photographers. The list includes Kaila Devi Sanctuary and Karauli Forest.